What happens if I buy Bitcoins and the price goes down. Will I lose a quantity of my money? If you bought a bar of gold at $1200 / ounce, then the price of the gold drops to $600 / ounce, you wouldn't actually lose any money at all unless you decided to sell your gold at that time. However, if you wait until the price of gold rises to $1800 / ounce, then sell it, you will gain money. The key is an ounce of gold is still an ounce of gold, regardless of the "price" in some other currency. Same goes for bitcoin, or indeed any currency. If you trade it at one price, then subsequently trade it at a different price, you'll either gain or lose money. If you bought one bitcoin and the price goes down, you still have one bitcoin. If the price goes up...still one bitcoin. This is just like everything else, including groceries, gasoline, gold, stock certificates, etc... Measurements of value in fiat (such as dollars) does not affect the amount something you own, only the price at which you will be able to sell that something. tl;dr- This is called a capital loss. You're said to realize the capital loss if you sell the Bitcoins at the lower price, such that you lost money due to having bought/sold them. However, note that this isn't legal advice and I'm unsure about what the current legal statutes are surrounding Bitcoin. A capital asset is defined to include property of any kind held by an assessee, whether connected with their business or profession or not connected with their business or profession. It includes all kinds of property, movable or immovable, tangible or intangible, fixed or circulating. Thus, land and building, plant and machinery, motorcar, furniture, jewellery, route permits, goodwill, tenancy rights, patents, trademarks, shares, debentures, securities, units, mutual funds, zero-coupon bonds etc. are capital assets. When a capital asset appreciates in value, it's called a capital gain, and may be subject to capital gains tax. And when a capital asset depreciates in value, it's called a capital loss (and sometimes results in a reduced tax burden). A loss is recognized when assets are sold for a price lower than the original purchase price. Realized loss occurs when an asset which was purchased at a level referred to as cost or book value is then disbursed for a value below its book value. Although the asset may have been held on the balance sheet at a fair value level below cost, the loss only becomes realized once the asset is off the books. You've suffered a capital loss. Before you sell the Bitcoins, it's an unrealized capital loss. After you sell the Bitcoins, it's a realized capital loss. The answer is not unique to bitcoin. It would be the same if you're dealing with (non-crypto) foreign currency, stock, a stock derivative or commodity or commodity futures. When you buy something like the above, you are giving up your "real money" (fiat currency) to take possession of said commodity/stock/bitcoin/etc (let's call these assets in general). You bought an asset at a particular market value, which can fluctuate over time. If it rises, it's worth more of the fiat currency. If it falls, it's worth less of the fiat currency. While you're still holding on to said asset, what you're experiencing are called unrealised gains and unrealised losses. The valuation chart fluctuates, but you're not seeing your purse of fiat currency changing in any way after the initial outlay. You won't actually feel the "pain" of a fall in value until you decide to sell the asset. At this point you will experience a realised loss. You will get back less of the fiat currency (real money) than you put in in the first place. Conversely, if the asset has risen in value, you'll get back more "real money" than you put in and you've made a realised gain. (I simplified the analysis to omit things like trading overheads - brokerage fees and commissions, etc. that always apply (those things always eat at your gains and losses pretty much equally). And taxes are a complex and murky thing I won't touch. And all this assumes you paid "real money" you actually had in full for the asset. If you borrowed money to buy the asset, that's called trading on margin and it can be much, much riskier - you're losing money in interest all the time and your losses can be more than the amount you borrowed to begin with. But ignore all these complications and focus just on the paragraphs above to give you a head start in understanding. And please learn more (and try trading simulations) before you trade real money for any asset). Yes, you lose a quantity of your money, at the time you gave it away in exchange for the bitcoin you received. Subsequent changes in the exchange rate only vary the hypothetical value of what you would get if you wanted to trade back. No; you lost the money when you used it to buy the Bitcoins. If the price goes down, you will get less money back if you sell them. If the price goes up, you will get more money back if you sell them. Yes and no, depends on your perspective. No: You lose money when you buy something, and you gain something else in return. In your case you lose money if you buy bitcoin, and you gain money when you sell bitcoin. Yes: The monetary equivalent value of your assets/wealth decreases if your assets lose value, and increases if your assets gain value. If you own $1'000'000 in Bitcoin and Bitcoins lose half their value, you now hold $500'000 in bitcoin. Notice that in the No case we count our Bitcoin in terms of # of coins, and in the yes case we thing of bitcoins in terms of $ of Bitcoins. If you were to count the value of all your assets in Bitcoins you'd gain value when the value of Bitcoins drops, because all your non-Bitcoin assets are now worth more Bitcoins, and the Bitcoin assets are still worth the same number of Bitcoins they used to be worth. It's more sensible, however, to value your assets in a currency that is stable and tied to most of your expenses. 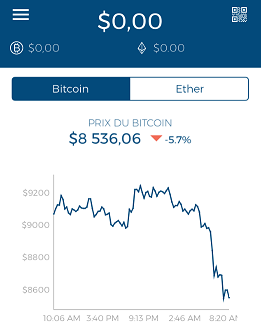 I would like to add another aspect: minimize loss, in case you want to protect your principal (and commission paid when you bought Bitcoin). Please look into 'stop loss order' in case you want to get out of the position while minimizing the loss because you are not certain when the price will return enough to get your position back to 'gain'. It seems you are rather new to trading. Please understand that there is no "magic money making" machine, and that trading profits are often viewed as the compensation for accepted risks. So be cautions with investing money whose loss you cannot afford. Bitcoin is highly volatile, meaning that the price changes in rapid succession. It might be hard for a beginner to handle. You can, of course, but be extra cautious compared to trading, say, Dow Jones values. Bitcoin has no intrinsic value. Gold can be used for making jewelry, Coca Cola can still produce more drinks, but for a Bitcoin you need someone else willing to pay for it. Without spreading too much fear and doubt, it bears some reminiscence to once highly-priced collector cards. The answer depends quite a lot on the semantics of the word "money". If money is those rectangular printed papers or circular metal discs made by the Federal Reserve in the United States of America as well as many other institutions in other nations then the answer is NO. You gave away (traded) some of those items when you bought the bitcoins. But a lowering of bitcoin value after that trade does not further diminish the amount of papers and discs you have. Money is any item or verifiable record that is generally accepted as payment for goods and services and repayment of debts in a particular country or socio-economic context. The main functions of money are distinguished as: a medium of exchange; a unit of account; a store of value; and, sometimes, a standard of deferred payment.Any item or verifiable record that fulfills these functions can be considered as money. The papers and discs fit that definition so no money loss there. But, what else fits that definition? Before they got lowered in price you could go to Newegg and purchase a certain ammount of items. What happens if you go to Newegg after they got lowered in price? If the answer is "I can buy the same" then no, you did not lose a quantity of your money. If the answer is "I can buy less for the same ammount of bitcoins than I could before the lowering" then yes, you did lose a quantity of your money. They are diminished as a medium of exchange, now you can exchange those bitcoins for less than you could before. Not the answer you're looking for? Browse other questions tagged trading value or ask your own question.